Critical Theory is crucial to any study of literature and also, as this book shows, to most of modern culture. 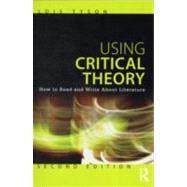 In her friendly, approachable style, Lois Tyson emphasises the importance of Critical Theory to students, explaining its relevance and how to use it. In this new edition, New Criticism is added to the list of six theories #xE2;#xAC;#x1C; psychoanalytic, Marxist, feminist, gay/lesbian, African American and postcolonial #xE2;#xAC;#x1C; which are explained and introduced before Tyson demonstrates how they can be employed to interpret five short literary works in the book: Emily Dickinson's I started Early -- Took My Dog, William Faulkner's A Rose for Emily, Ralph Ellison's The Battle Royal, Alice Walker's Everyday Use,and Jewelle Gomez's Don't Explain. In addition, a chapter on reader-response theory shows students how to understand their personal responses to literature and how to use their personal responses to produce more insightful interpretations while avoiding the typical pitfalls to which their personal responses make them vulnerable. Other new features include more resources for students wishing to further their understanding of specific theories through new sections on #xE2;#xAC;#xDC;further practice#xE2;#xAC;" and #xE2;#xAC;#xDC;further reading#xE2;#xAC;" for each chapter and a #xE2;#xAC;#xDC;next-step#xE2;#xAC;" appendix addressing additional literary works for further study that readily lend themselves to theory. The book is also updated throughout, making it the ideal first step into critical theory for students of literature, composition and cultural studies.